Want a toy that will keep your baby entertained and that is also good for their development? Put your wallet away, because you probably already have this in your home: mirrors! Yes, that mirror hanging on your bathroom wall can help your baby’s development! Why do babies like mirrors? Babies love faces! 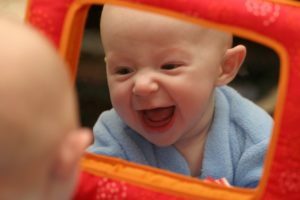 Babies especially love the faces of their parents and caregivers, but they also enjoy seeing all types of faces whether they are in books, faces of friendly visitors, or you guessed it – in the mirror! How can playing with mirrors help my baby learn? Mirrors are a great way to help babies explore. Try holding baby in front of the mirror. They may even reach out to touch the “baby” in the mirror. Eventually, they will learn they are seeing their own face and start to recognize their reflection. While looking in the mirror with your baby, you can use this chance to help develop their vocabulary! Say the different parts of the face as you point to them on your face and baby’s. If you are in front of a bathroom mirror with baby, that is a great place to respond to baby’s babbling and make noises with baby. The extra echo makes it even more fun! A mirror is also a great way for baby to practice visual tracking. Make silly faces at baby in the mirror and see if they imitate you or make a different face back. Get siblings involved too for fun, bonding time! Do I have to spend all day in front of the bathroom mirror? No, of course not! There are small mirrors made for baby to play with and even toys that have a mirror built-in. Make sure the mirror is unbreakable before giving it to baby. If there are any chips or cracks, do not give the mirror to baby as it may not be safe. Baby will enjoy playing with their mirror on the floor, in their high chair, or even in the car. Keep in mind that games you already play with your baby, such as peek-a-boo, can be extra fun with a mirror! Do you know when to start baby on solid foods? Use these tips to determine if your baby is ready. Traveling with baby can be very different. Get tips to make the trip smoother! Next Next post: Getting Preschoolers to Share…How Do You Do It?